Pre-Intermediate Lesson 1. Introduction and nationalities. Whereabouts? 1a. Read and listen. Where are Michael and Zolfa from? Michael Hi. My name's Michael. Zofia Pleased to meet you, Michael. I'm Zofia. Michael Sorry. What's your name again? Zofia It's Zofia - Z-O-F-I-A. Michael Oh, OK. Nice to meet you, Zofia. Zofia Where are you from, Michael? Michael I'm from Canada. And you? Zofia Krakow. Do you know it? Michael Yes, I do. I was there last year with my wife. 1b. Practise the conversation. Listen and repeat. A Where are you from? A Where is she from? B She's from New York. 2. Listen. 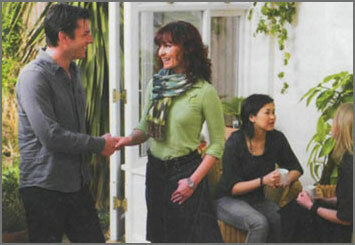 Michael introduces a woman to Zofia. Choose the correct answers. 3b. Listen, check, and repeat. 4a. Drill. Listen. Say the nationalities. 1. - > . 4. -> . 2. -> . 5. -> . 3. -> . 6. -> . 5. Make your own dialogue. Use your name and a name of your friends. A Hi, Niran. This is my friend, Judit. B Pleased to meet you. Sorry. What's your name again? C It's Judit. Nice to meet you, too. B What about you, Judit? Where are you from?